Earlier this week I learned that Queenie One Elephant’s Story, will not be reprinted. I’ve been very fortunate in my writing career in that this is the first of my picture books to officially be going out of print and gosh it hurts. I’m sure there are several of my educational books which are now unavailable but being my first picture book, Queenie is different. I’ve shared the story many times of how my writing of Queenie came about but in brief, I was writing a story about house sparrows (which is still languishing in a bottom drawer) when someone suggested I contact the Melbourne zoo regarding sparrow information. I have no idea how I ended up away from the birds and amongst the elephants but I did and there I found a one page article on Queenie. I cried, then cried some more but also knew at that moment, I would write her story. It took over 4 years of research and writing, delving through zoo records at the Public Records Office of Victoria and at the zoo, but by far the best information I found was from the people I met, those who had in some way been connected with Queenie and the zoo. I was offered a contract from Maryann Ballantyne and Andrew Kelly at Black Dog Books, one of the absolute high points of my writing life. Peter Gouldthorpe agreed to illustrate and, as they say, the rest is history. 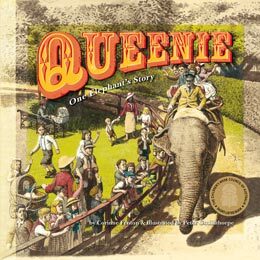 On 22nd January, 2012 we launched the paperback of Queenie at the Melbourne Zoo and 5 years before that in August, 2006 we launched the hardback at the Melbourne Museum. At the first launch I said the reason I wrote her story was to introduce her to a new generation, so she would never be forgotten. I believe she earned that right. For both launches the channel 9 news also came along – the first time I was absolutely terrified – there is a separate very funny story about that. Queenie carried up to 12 passengers at a time, up to 500 a day. She walked the circuit giving rides at the zoo for almost 40 years, walked over 100,000 miles (about 161,000 kilometres) and carried well over a million passengers. I met the little boy in the middle of the photo below in 2013 and gave him a copy of the book. Over the last 12 years I’ve introduced Queenie to children at schools, libraries, writer’s festivals and bookshop signings and watched as they tug their parents sleeves and say ‘There’s Queenie’. Queenie the book has proven to me that picture books are not only for children but can be enjoyed by seniors and all ages in between. I am now very lucky to have a precious collection of letters and drawings from children – the drawings often show Queenie with a pink bow and always with very long eyelashes and the letters are always thoughtful and heartfelt. I’ve met hundreds of people who remember riding on this beautiful animal. After one radio interview I was contacted by the family of Wilfred Lawson, the keeper who died in 1944. His grand-daughter told me that they never blamed Queenie for his death. There was another young girl, who at 11 or 12 years old, used to walk from South Melbourne into the zoo to have a ride on Queenie every Saturday afternoon. In later years she and her husband-to-be would also visit Queenie when they were “courting’. Over the years she told the story to her children and grandchildren. When the book came out, her grandchildren read it to her over and over and they believed that one of the little girls in the illustrations in the book, was in fact their grandmother. In my letter-box one day I received a stunning photo of two toddlers in an old-fashioned pram – and Queenie, her trunk also in the pram. This photo sits on my desk. I met Kerryn – part of her family history goes like this. Kerryn’s mother was at the zoo one day with Kerryn’s older sister Maggie who was then about 3. Queenie reached out and took Maggie from her mother’s arms and then returned her. A bit unbelieveable, I know, but I’m assured this did happen. In 1902 Frederick Shepherd Grimwade who was then the President of the Zoological & Acclimatisation Society of Victoria donated the cost of Queenie to the zoo and because of his gift Queenie was known as the Grimwade elephant. Members of the Grimwade family attended both launches. I was told about another lady who walked into a book store and bought a copy when the book first came out and for some reason she began reading it in the shop. She started crying and the bookseller went to her and said, ‘We know it’s sad, but are you ok?’ The lady replied, that until that moment, she had always believed Queenie had been sent back to India, because that’s what her parents told her. So like Queenie, even that has come full circle. Along the way I also found Barbara, who in 1931 wrote a letter to Andrew Wilkie, who was then Director of the Zoo. (His grandson and great-grand-daughter and great, great grandchildren came to both launches.) As a little girl of 4 ½ years, Barbara was worried that Queenie would be jealous of the new merry-go-round that had just been installed. Barbara told me there was a jingling sound and a snuffling noise of Queenie picking up the apples and peanuts in her trunk. There was dust and darkness in the elephant loading stage, then suddenly a giant grey creature would be there in front of you. At a bookshop another day I met a gentleman clutching some papers. It turned out he was the assistant pastry chef who helped decorate Queenie’s cakes from 1940 to 1944 and he’d brought with him his apprentice papers to show me. Maurice attended the 2012 launch. Queenie the book was written about and reviewed in many newspapers, everything from the Warrandyte Diary . . . and when the hardback version was released in the US, it was reviewed in the Wall Street Journal. The book was named an Honour Book in the 2007 Children’s Book Council Book of the year awards. I was once contacted by a group who were planning to do a movie, but sadly, that never came to be. Maryann Ballantyne has always said that she knew the power of Queenie from when her mother told her Queenie’s story when she was small and Andrew’s parents met on the back of Queenie when they were 3 years old – they all came to the launches. I hope now that this beautiful animal, will be remembered forever.